Are you the Runner Girl? Might you be known for athleticism and endurance? This is your decal. 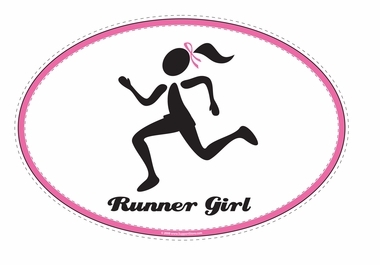 This Pink Ribbon ”Runner Girl” Bumper Sticker Decal is 4" x 6". It is made of Zip Strip® vinyl, which has a removable adhesive that ensures clean and easy removal. Our Pink Ribbon ”Runner Girl” Bumper Sticker Decal is perfect for indoor or outdoor use, and it is a "Retail Ready" item, which includes a removable header, bar code and punch hole for display purposes. The full size with the header is 4.5" x 7.5". Designed and made in the USA. Runner girl decal. Love it! I was very pleased with this item. Looking forward to giving them out to my girlfriends for a meet and greet I'm having for those running the Philly Half/full Marathon.